The Atmosphere has been published by the Korean Meteorological Society (KMS) in March, June, September, and December since June 1991. Abbreviated title is Atmos. The Atmosphere publishes original scientific research in all the fields of atmospheric sciences and related areas. In addition to original research article, the Atmosphere publishes comprehensive reviews on topical subjects, brief research/technical notes, and communications of preliminary results. 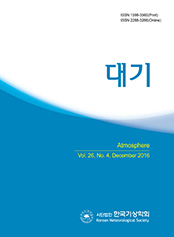 The Atmosphere is official KCI registered journal and can be searched by Korea Citation Index.